Bring a Trust Educator into your classroom with a custom workshop designed just for you. 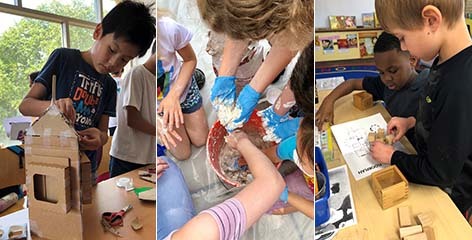 Each workshop is focused on a design or artmaking activity inspired by Wright’s legacy and can be tailored to classroom objectives and student needs. Choose from the workshop themes below or from any of the lessons available at teachingbydesign.org. The workshop fee is per class and includes all required supplies. Workshops can be coordinated with tours of a Trust site, our rentable learning kits, or additional workshop sessions. Explore how Wright uses simple geometric shapes to create new and surprising designs and patterns. Build with Froebel blocks, design unique art glass pieces, or create the next innovative style of architecture. Become inspired by nature and the Midwest landscape! Wright created a new, American architecture that featured bold, horizontal lines, hipped roofs, planters filled with plants and shrubs, simple materials, and a natural color palette. Explore Wright’s Prairie style and the unique patterns and colors found in nature. To schedule a tour or program, please complete the interest form.